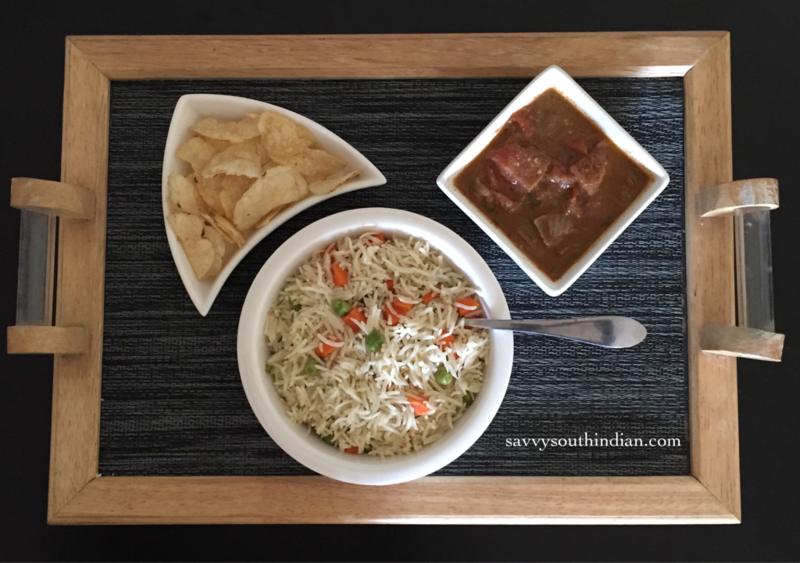 This is a tasty dish made with a naturally aromatic basmati rice which is an authentic Indian rice with beautiful long grains. To top that, it’s flavored with ghee and spices. It’s always served with our flavorful curries and gravies in India. 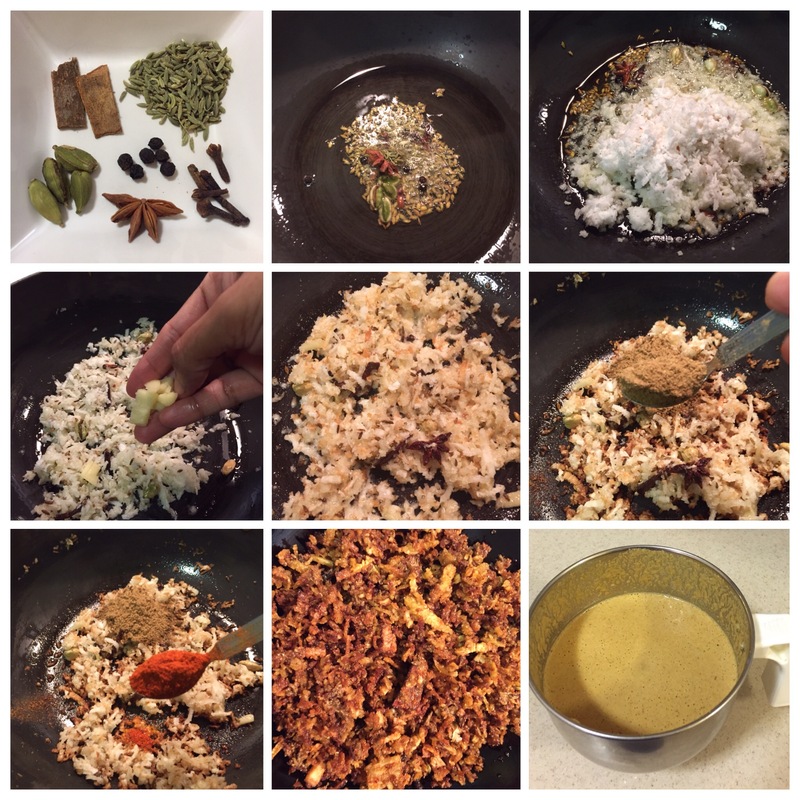 Since the kurma takes more time than the rice we are making this first, by the time it’s done the rice will be ready. So we can have a tasty lunch. Heat 2 teaspoons of oil in a pan ,Add the whole spices. Once the spices are toasted the pepper, cardamom and cloves pop. This actually releases the full flavor. Now add the grated coconut, ginger and toast it slightly brown. If it browns too much it gives a bitter taste. Slightly toast it with the spices and follow the same procedure. Add the coriander powder, chili powder and toast it for a couple of seconds. If you don’t want this to be spicy just add paprika instead, it gives you this red color without any heat. Transfer it into a bowl and let it cool . If you leave it in the hot pan it gets burnt. 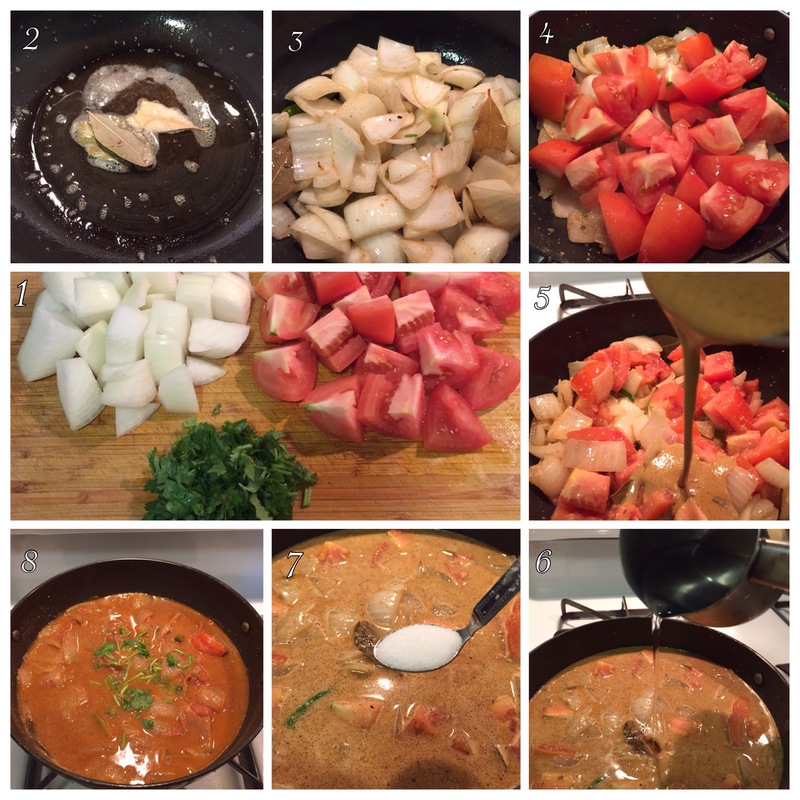 Chop 1 big onion and 2 tomatoes into medium size cubes . Add the rest of the oil and 2 bay leaves. Make sure to cut them in big pieces and sauté them slightly so that it holds their shape until the kurma is done. Put a lid and let it simmer for sometime. When you take the lid off the aroma you get is unbelievable. 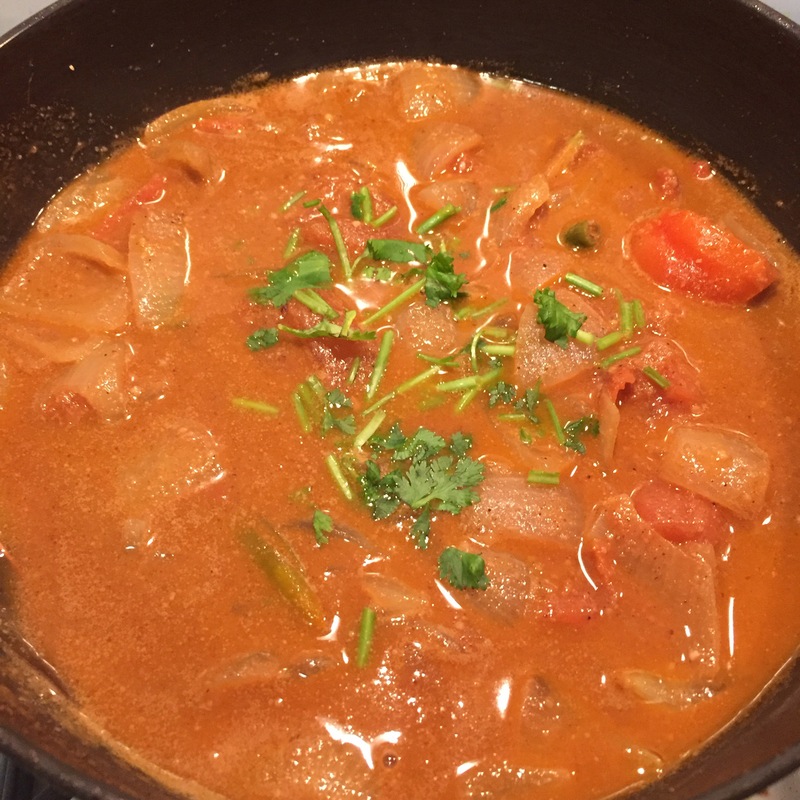 The coconut and coriander powder thickens and makes this beautiful flavorful gravy. Now we need something to go with it right ? 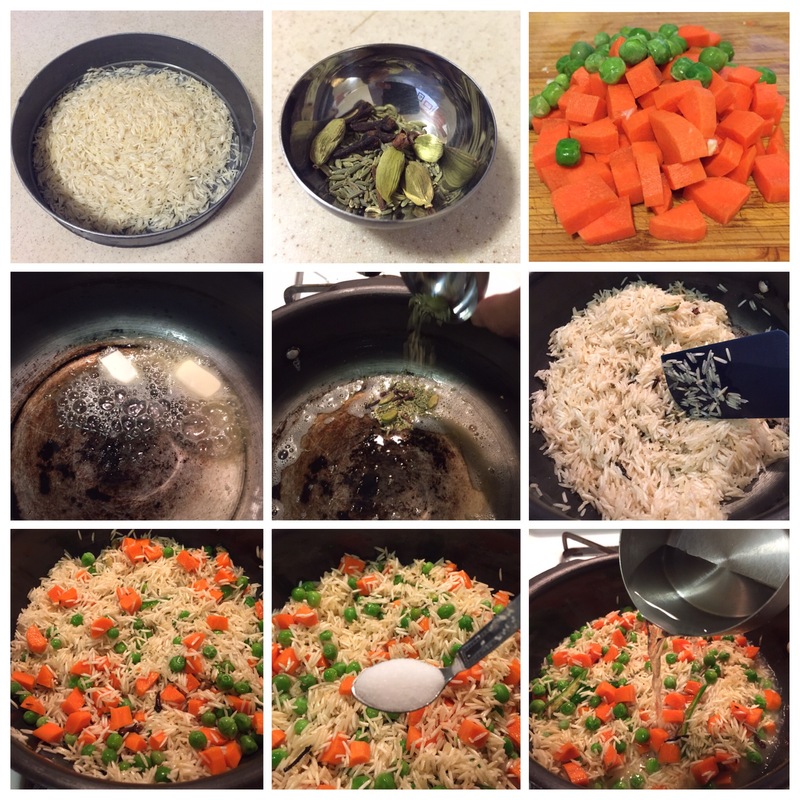 I’m going to show you how I make this very tasty ghee rice. Heat the pan add 1 teaspoon of ghee and butter add the whole spices sauté them, No need to pop it since it’s going to be cooked with the rice. If you don’t have ghee just use butter, make sure it doesn’t get brown, it completely changes the color and taste of the rice. Add 1 1/2 cups of water if cooking in a pressure pan . After 2 short whistles its done. Toasted rice cooks faster so you need slightly less water, so that it doesn’t get sticky. If you are cooking it in a pan or electric cooker add two cups of water as usual and cook it until it’s done. When the rice is hot and steamy add another teaspoon of ghee it melts and perfumes the rice, it gets shiny and the aroma is awesome(this step is optional). Now gently fluff up the rice with a fork. To make this festive you can garnish it with a pinch of saffron and fried cashews. You know when you have mastered the art of making ghee rice if every single grain is fully bloomed and the tips are intact and they are not sticky. You will get the best outcome if you use the best quality basmati rice. 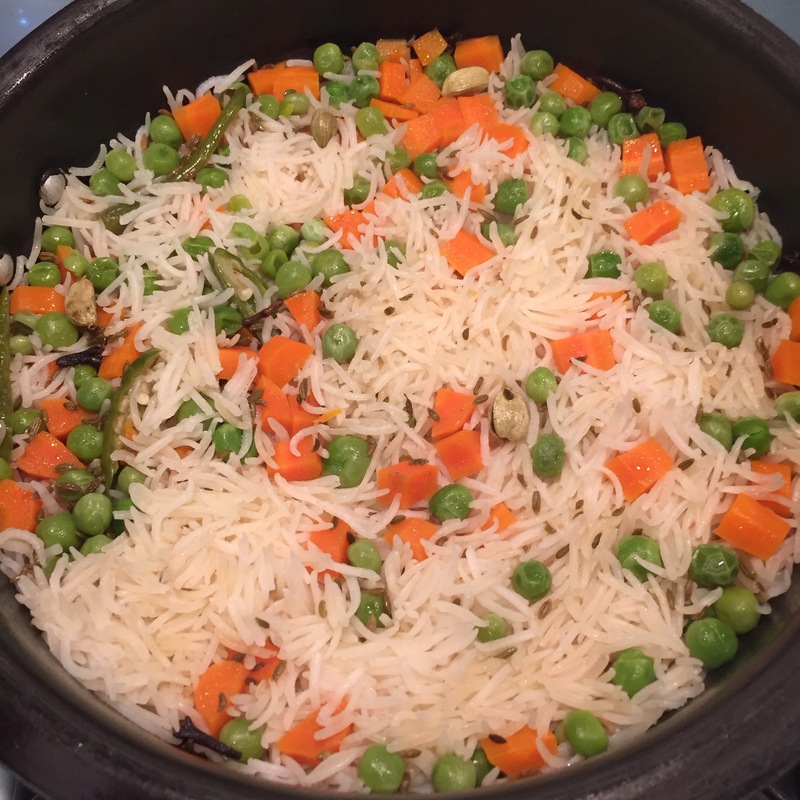 This shiny flavorful white rice studded with colorful carrots and peas is so hard to resist. 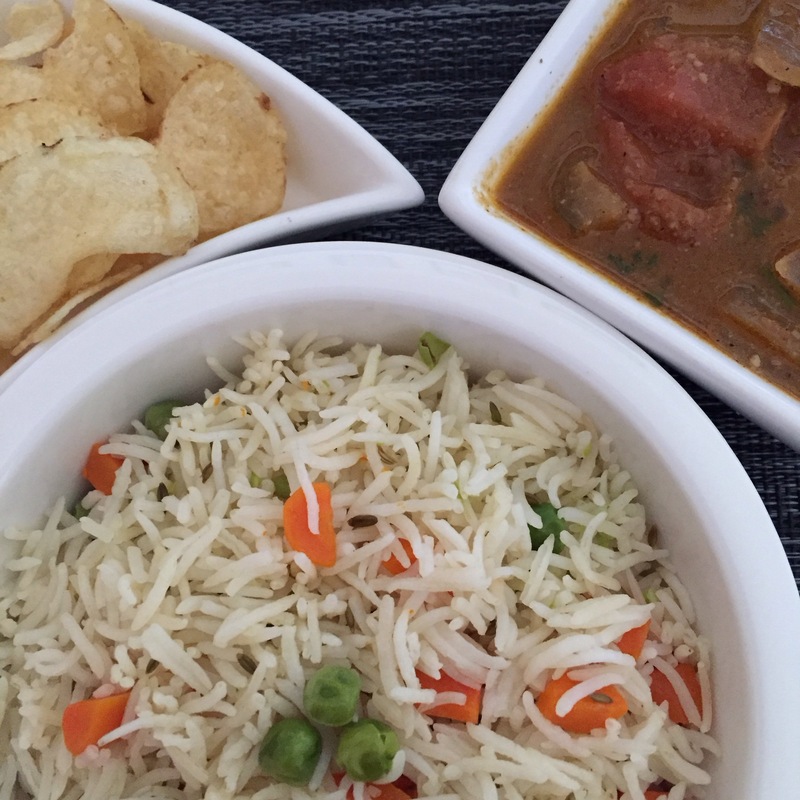 A good helping of ghee rice with the tangy flavorful kurma and some crunchy potato chips, Yum … it just hits the spot. This is my favorite weekend lunch. 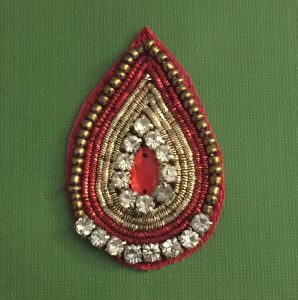 Hope you like it too. This kurma tastes great with chappathi/ roti or any flatbread . Ghee is a quintessential ingredient in Indian cuisine. Ghee is the clarified state of butter . It has this Amber color and extremely flavorful. It is used in moderation because it’s very rich. And it’s normally added at the end of the cooking process as a finishing touch to preserve the aroma. Since its already clarified it burns quickly to avoid this make sure you add oil or butter with it if you are cooking with ghee. According to my mom it’s a sin if you buy ghee from a store. Literally every Indian knows how to make ghee. It’s very easy and takes only 15 minutes. In a cold pan put a log of unsalted butter, Refrigerated or room temperature doesn’t matter. Put it on a medium heat. It slowly starts to melt. Once the milk solids are cooked it starts to clear slowly. The bottom of the pan looks dark brown in color. It’s a sign that the ghee is ready. Use a spoon to slightly move the foam to the side, You see this amber color ghee and you can smell the aroma. Don’t leave it any longer otherwise it burns. In a glass bottle put a sieve and pour the ghee through it to get this beautiful clear ghee. You see the browned fenugreek seeds add it back to the ghee. Fenugreek has medicinal qualities that’s why we add it . But it’s optional. I have used a stainless steel pan so that the color of the ghee is nicely seen. But I advice you to use a non stick pan to make the cleaning process easy. You have to keep your eyes on it do not leave it unattended. This might seem like a long process but I’m telling you it’s worth it . Nothing beats the sweet smell of home made ghee, it literally makes everything delicious. 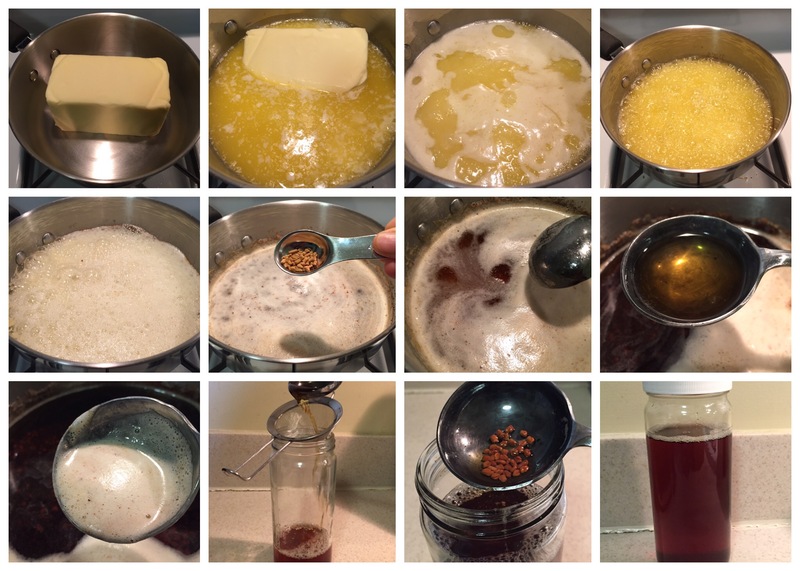 My mom taught me how to make ghee and I’m happy to share it with you all.